Rome as the capital of Christianity is naturally a city of churches. There are 80 churches alone ordained by the Holy Mother Mary in Rome. 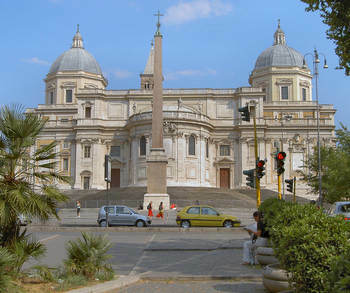 The largest, oldest and most important of these is the Santa Maria Maggiore. It belongs to the four major churches (papal basilicas) of Rome. The founding of the church is linked to an interesting legend. In the night of 5th August, 352 the pope at the time - Pope Liberius as well as a wealthy merchant named John, both had a vision of the Virgin Mary in which both were ordered to erect a church in her honour at the place at which it would snow the following day. The next day it actually snowed at the spot on the Esquiline Hill where the Santa Maria Maggiore now stands. Whoever knows Rome will know that this truly is a wonder as the city in the month of August – the peak of summer time practically lies in an oven, and snow would be almost impossible. The Church is the only in the city in which from its point of inauguration until today has held a holy mass every day without interruption. The outer façade of the church dates back to the Baroque period. The great treasures of the church however are the mosaics on its interior. Several of these originate from the founding period. If one happens to be dwelling in Rome in early August, one should not miss attending a Mass. At the end of the service, white petals float down from the ceiling to commemorate the miracle that led to the founding of the church. In the evenings entertainment programmes are held on the square outside of the church including foam machines that create the effect of snow. The Santa Maria Maggiore can be reached via metro – line ‘A’ or by tram- line ‘5’ and ‘14’ or also by bus via the routes C3, 16, 70, 71, 75, 3670, 590, 649 and 714. The church is open daily from 7-19:00. The Lateran Basilica is also one of the 4 papal basilicas of Rome. It is the oldest church in the city. It was once the seat of a prestigious Roman patrician family – the Lateranis. The building came into imperial possession and the first Christian king – Constantine the great, gave it as a gift to the Christians in 312 so that they could create in it a place to hold their religious services. The building complex was extended further and further – even the destruction caused by an earthquake could not alter this change from the 9th to the 10th century. Until the year 1309 when they temporarily went to Avignon in France, the Lateran was always the seat of the Popes. As it was in a poor structural condition when the Popes returned to Rome in 1377, the Vatican was elected as the new seat for the Popes. Today’s Lateran Palace originates from the 16th Century and was built in the years 1587- 1589 by the Italian architect Domenico Fontana, whilst the present day Lateran Basilica – a part of the building complex, originates from 1650. The preserved relics of the heads of Petrus and Paul are kept here. 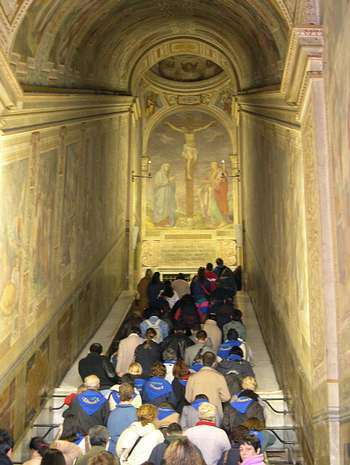 Until today the Holy Stairs are still shown in the Lateran Palace. They are said to originate from the palace of Pontius Pilate in Jerusalem. Jesus Christ was once led up them to Pontius Pilate; Helena, the mother of Emperor Constantine brought them to Rome. Even today the staircase is revered by believers in remembrance of Christ. The Lateran Basilica and Palace can be reached via the metro– line ‘A’, station San Giovanni or via the bus - route numbers 16, 81, 85, 87, 117, 186, 218, 571, 650, 665 und 850. Opening hours are daily from approximately 7am – 18:00.